Whew – after a deliciously sugary, fatty and red meat-filled Christmas break, the wife and I decided that it’s time to cut back. After all, the season of over-indulgence is no longer upon us. But how to cut back? Should I cut out red meat entirely? Should I go completely plant-based? Should I stop drinking beer and wine? Should I adhere to the interesting, albeit incredibly expensive looking, Bon Appetit January cleanse? Although the answer to each of these rhetorical questions should probably be a resounding “yes”, those things will never happen. Ever. Even if there’s a fire. I will never give up the things I love, and as you can tell by the title of this blog, I love food and beer. What will happen though is a – mostly – smooth return to our basic health philosophy: pay attention to what we eat, make a concerted effort to be healthy, and try to get regular exercise. So as I try to come down off of a Holiday-induced fat and sugar high, I have to start adding back in the things that have been missing from my diet. Namely, vegetables. Lots of them. With this in mind, I visited the grocery store last Sunday with a very basic idea for an all veggie meal, and left forty five minutes later with a cart full of produce. That load of greens turned into a beautiful, bountiful bowl of savory soup. Place a large soup on the stove, add the oil, and turn the heat to medium-low. When the oil is heated, add the leeks and garlic, and allow them to sweat for about 6 minutes. Add the rest of the vegetables, and stir them together before adding the stock. Season the veggie mixture with the dried oregano, dried basil and salt and pepper, mix it all together, and then add the stock and broth. Simmer the soup, stirring occasionally, until the veggies are tender – about 30 minutes. Add the fresh parsley and basil, and season the broth to taste. Speaking of enjoying this soup, go ahead and indulge, because – as calculated – each serving of this savory vegan concoction weighs in at a whopping 175 calories. It was great! 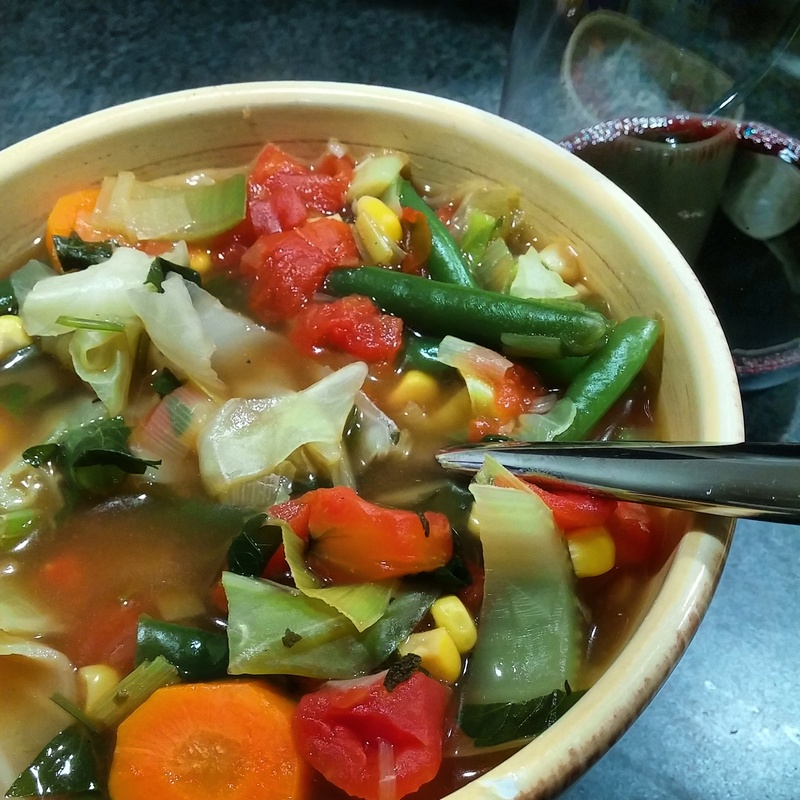 The wonderful thing about this soup is that it’s very forgiving – you can include or leave out other ingredients, and it ends up being delicious in the end!